Sea kayaking with seakayakphoto.com: All washed up at Ardrossan South Beach. As we approached Ardrossan on the Ayrshire coast, it was just after low water and we had to drop our sails as we crossed the dangerous reefs of YellowCraigs, Half Tide Rock, Broad Rock,West Crinan Rock and other rocks, which are not even named. 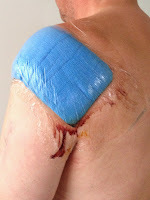 We had been travelling fast under sail and hitting a submerged reef in a loaded boat at speed is not funny. Ardrossan is derived from the Gaelic "height of the rocky point" and it is one of the few rocky breaches in the great Ayrshire sand dune system that stretches for over 40 kilometers from Farland Head in the north to the Heads of Ayr in the south. 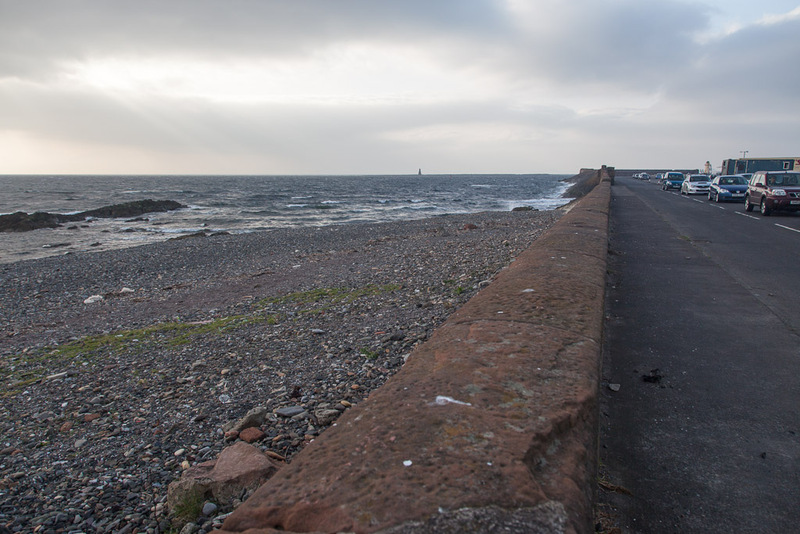 Ardrossan's rocks created a natural harbour on this otherwise exposed coast of shifting sands. Fortunately there were no ferries entering or leaving the entrance to Ardrossan Harbour, which is marked by a small lighthouse. The light was originally erected in 1850 but was carried away in the great storm of December 1900. The current light was erected in 1901. 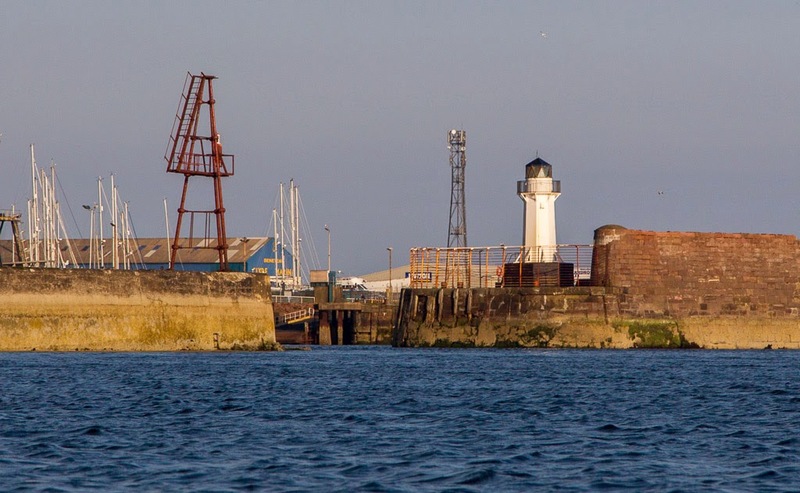 In the early 19th century Ardrossan was a major port and shipyard for the rapidly growing city of Glasgow and it was planned to link to Glasgow by canal. The canal was built half way before another scheme involving dredging the River Clyde made it redundant. Over the years the shipyards have closed, ferries have stopped running and the inner harbour has closed as a port and has now been converted to a yacht marina. I do hope the new Caledonian MacBrayne summer ferry to Campbeltown (which we used) is a success. ...when it would have been possible to land at this beach at the south end of the harbour wall, which is only 1m high at this point. Due to a change of plan caused by my injured shoulder, we actually arrived at Ardrossan at low tide and so the upper beach was cut off from the sea by vicious exposed reefs. We had no option but to paddle on, out round the end of Castle Craigs rock. This is a remarkable ribbon of basalt dyke, which stretches half a kilometer out to sea. It arises inland from the volcanic plug on which Ardrossan Castle sits. We were all tired and Mike and Phil tried to find a shortcut through the rocks. I knew there was none but they could not hear my shouts over the offshore wind. We finally arrived in South Bay Ardrossan some 200 km after setting off from Campbeltown on the far side of the Firth of Clyde. 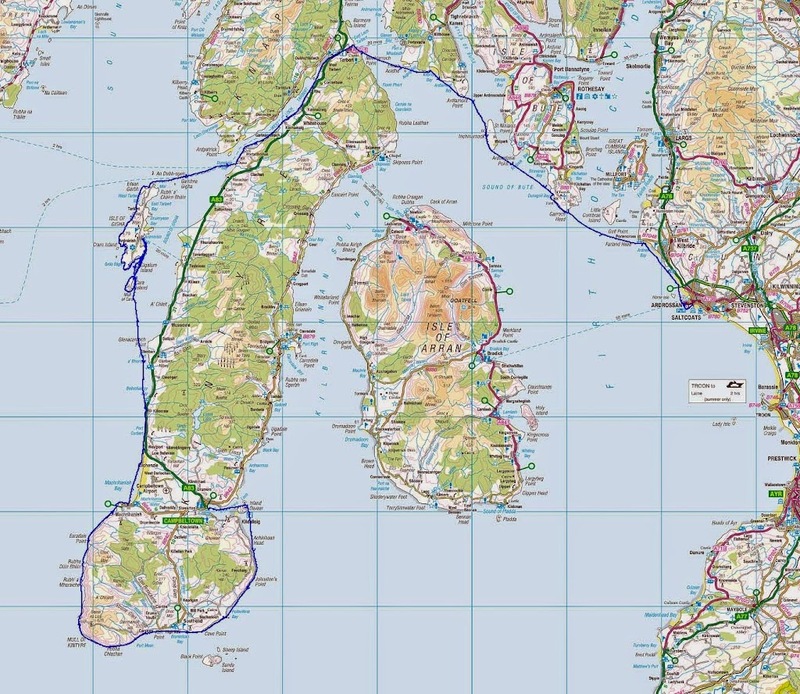 It had been a wonderful trip, involving the tides of the Mull of Kintyre, the huge surf beaches of Machrihanish, visiting the Hebridean isles of Cara and Gigha then portaging from the Atlantic coast from the head of West Loch Tarbert to East Loch Tarbert in the Firth of Clyde. 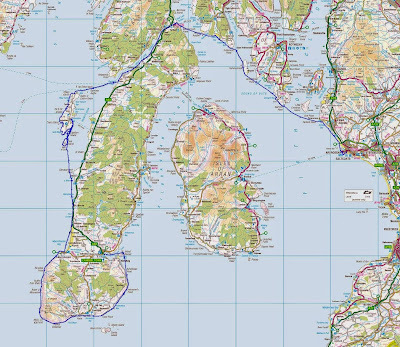 Finally we crossed the mouth of Loch Fyne and made our way back to Ardrossan via the Firth of Clyde islands of Inchmarnock, Bute and Little Cumbrae. On the way we had seen dolphins, porpoises and otters not to mention birds of every size from puffins to gannets. 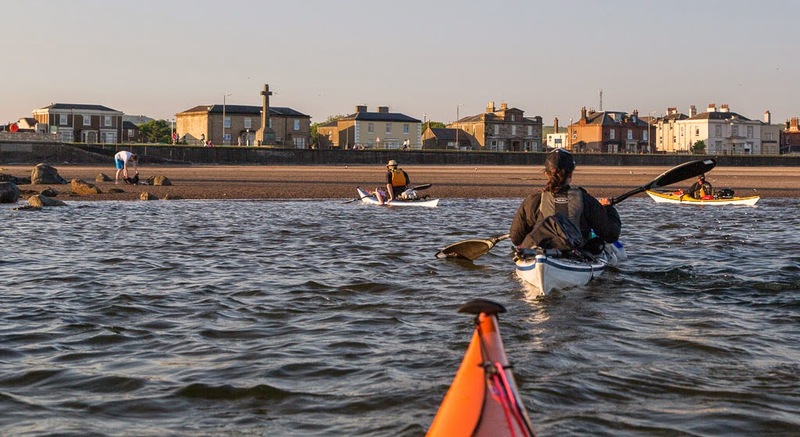 It was one of the best sea kayaking trips that Jennifer, Mike, Phil and I had ever been on. Perhaps the greatest surprise was just how good the Firth of Clyde section had proved. We had expected it to be an anticlimax after the Atlantic coast but its views and wildlife were superlative. We finally landed on the sands of Ardrossan South Bay at 20:15. At low tide it is 250m to the concrete ramp to the esplanade. We were grateful to have our kayak trolleys as it was a further 150m to a small carpark, where we left the kayaks and walked the 1 kilometer back to the 24hr ferry car park to recover the cars. 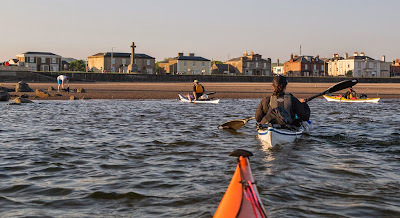 Ardrossan is not the sort of place to leave kayaks unguarded late on a Friday evening, so two of us stayed by the kayaks while two went for the cars. At the end of this trip my shoulder was in agony. I had injured it some six months previously when lifting a kayak unaided off my car roof rack. It was clear that this would be my last long paddle of 2013 and that I needed to see a shoulder surgeon. An MRI arthrogram showed I had completely torn muscles off the humerus and torn the joint capsule. It was expertly surgically repaired by one of my former colleagues at the end of July but I am still off the water two months later. The moral of this story is don't try to lift kayaks on or off car roof racks on your own, get yourself some help or get a Karitek Easy Load Roof Rack instead. Many thanks for sharing your journey! I do hope you are better now and I and quite a few others, I assume, look forward to view more of your kayak trips in a near future! Douglas this has been a really enjoyable story. Its monday morning and I am sorry it has come to an end. I don,t know what I will do until you start blogging again. I can't believe you got so many great photos, I usually just get one or two good ones out of a week. Usually I head to the north west of Scotland on my rare weeks away. This has really inspired me to look at the south west. It would probably give me another two days on the water out of a week. Talking of the water I hope your shoulder heals up and you are able to get back out soon. Thanks for a great blog, cheers Jim.